It’s here! It’s here! The whole spoiler is likely released today but most of it is known and it’s time to examine what these cards will do for our beloved casual formats. #1: If these see a lot of Standard/Modern/Legacy play, they will cost more. A given piece of information at this point, but I don’t play those formats heavily enough to predict those prices. I do play lots of Commander and Cube and random casual decks, and that’s what today will focus on. #2: Expeditions may cause a glut. It’s been discussed ad nauseum at this point but just so we are clear: If people and stores crack lots of product in the search for Expeditions cards (so ugly, yet so profitable!) then everything else will be more available. #3: Casual eldrazi/colorless decks are much more popular than you think they are. 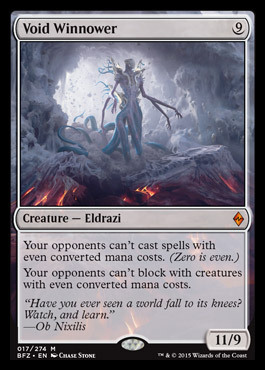 This is a key factor in why older eldrazi like It that Betrays had a higher price than you would have thought. At least, before it was reprinted. The hand-in-hand mechanics of ingest and processors will encourage these types of decks and will have a small effect on prices. 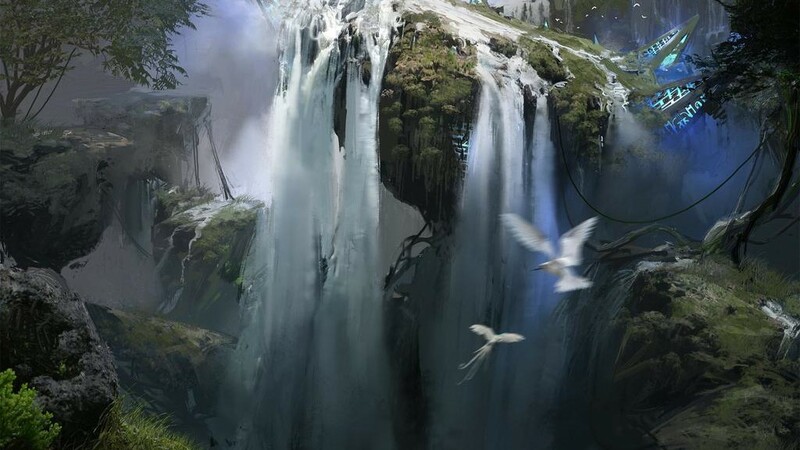 Gideon, Ally of Zendikar – Zendikar was printed right as Commander was becoming an acknowledged format, but it wasn’t designed with the same awareness that cards have these days. Allies, like werewolves, are crying out for legendary support, but even more than that, they are looking for a repeatable way to trigger rally in old cards or new ones. Gideon is that way. 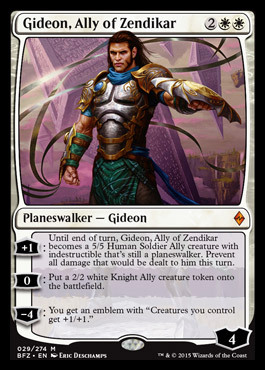 I can see Gideon keeping a price of no less than $15 while in Standard but the token allies and the potentially repeatable emblem will make sure it never goes less than $10, even after he rotates. Kiora, Master of the Depths – Her plus ability is neat and such a win in my Experiment Kraj deck, but the glory is really had in her -2 ability. Being able to draw one card is handy but in a significant number of activations that will be a -2 to draw two cards. The octo-fight ultimate is just amazing too. I think she won’t crack $15 during her life in Standard though. 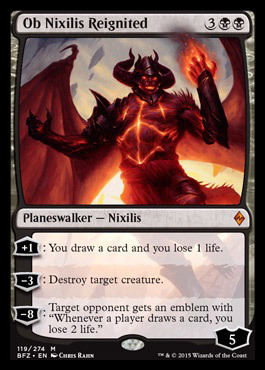 Ob Nixilis Reignited – I love the simplicity of this card. Draw, kill, and eventually win. The inevitability of the ultimate, especially in multiplayer games, is just phenomenal. This is likely one of the most played cards in the set in any casual or constructed format, and a card that is just fine to draw multiples of. I’d be surprised if it went much below $20. Sire of Stagnation – The parallels with Consecrated Sphinx are deserved, even if it’s a touch more conditional. No one has to play a land, but if they do, you get all the benefit. I’m not sure if this is worth the effort in a Sultai deck, playing cards like Collective Voyage and such, but it sure intrigues me. Since other players can simply not play lands for a turn or two, and this has no protection at all, I don’t think it will have a huge price, likely staying under $5. Dragonmaster Outcast – This will be the nail in the coffin. The nigh price was entirely due to the age of the card and the low supply. The drop has begun and it won’t stop until it’s at $3 or less. 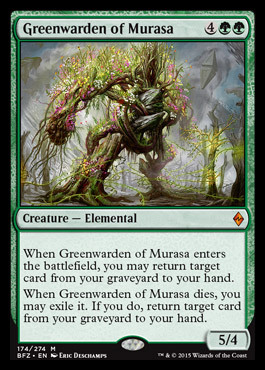 Greenwarden of Murasa – I think that this is a fixed Eternal Witness, not just in mana cost, but in the exile ability. I played in drafts where someone would have two and just loop them endlessly, like Gravediggers or Myr Retrievers. Ugh. Travis mentioned on Twitter this week that the Greenwarden is the perfect card to pair with See the Unwritten, and I would enjoy that interaction every time I thought I could get away with it. I don’t see this as a replacement for the Witness, and not every deck needs two or eight pieces of recursion like this. I want this to keep a price but I believe it will be available for under $2 pretty quickly. 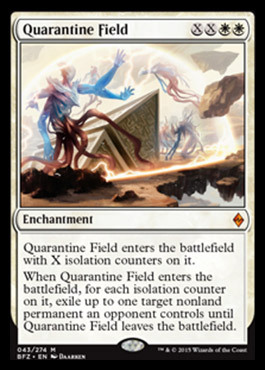 Quarantine Field – There’s enough of this effect that I don’t see this seeing huge play. Oblivion Ring offers permanent exile shenanigans if you can bounce it at instant speed, that’s the sort of effect that gets a Commander player going. More casual decks will like how this scales…sort of. Four mana for the first, six for two targets, and eight mana for three. That works in Limited, but I would hesitate in Commander, since it’s pretty easy to kill the enchantment and get it back. Likely a bulk mythic. Felidar Sovereign – Another card doomed for the bulk bin after being a quite expensive card, this was a mythic and is now a rare. Alternate win conditions are lots of fun, but this will not hold any sort of value. Drana, Liberator of Malakir – First and foremost: she grows herself with every hit. That’s useful, but because of the timing, she has the chance to grow your army before regular damage is dealt. It does require an all-in sort of attack, where if Drana is killed before she hits then you’re going to take it on the chin, but it’ll upgrade creatures trading into a win for you under most circumstances. She’s a good vampire but not amazing, and will be a bulk mythic. 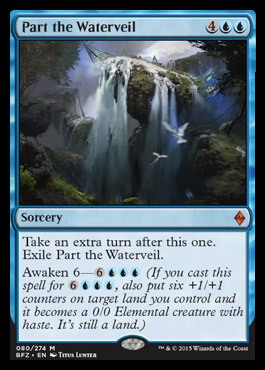 Part the Waterveil – There is always going to be a small market for extra-turn cards, but the new ones are never going to be as good as the old ones. This will be bulk but will take an extra week or two to get there. It’s notable that you do get a turn and a creature in one spell, which is pretty unusual but not worth it at nine mana. 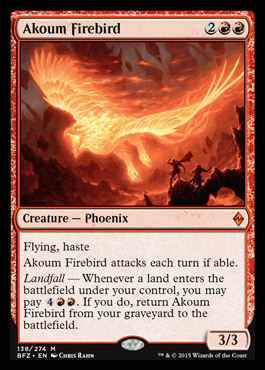 Akoum Firebird – This is an okay variation on phoenixes, but six mana to bring back a 3/3 flying haste probably isn’t what most aggressive decks want to do. This, sadly, is going to be another bulk mythic. Undergrowth Champion – I think this has potential in Standard. Not sure if it’s good enough in serious ramp decks, because this has to be in play first. I don’t think I would play it in an Omnath deck, as I’d prefer things to play with all that mana. It will see some play but not enough at kitchen tables to keep it above $2-$3. Ulamog, the Ceaseless Hunger – Ulamog’s first incarnation could be stopped by chump blocks and tokens. Annihilator 4 is a lot of sacrificing but I’ve seen people hold up well. Exiling twenty cards per attack is rather outstanding, though, and a very nice alternate win condition. This can be cheated into play, unlike the original, which is probably an upgrade for players. I think Ulamog will stay between $15-20 for the foreseeable future. Void Winnower – Let’s just concede to the ‘can’t even’ jokes and acknowledge that this is awesome. We’ve never had an effect like this, outside of some of the red cards like Chaos Moon. I think that foils on this will have a real premium, and if a companion card is printed that affects evens, that will be even more expensive. Oblivion Sower – As the promo foil in the duel deck, this card has no chance to hold a high price. Its effect is amazing and worth planning on, since it can be a big burst of mana if everything lines up right. Still, it’s going to be at $2 or less. 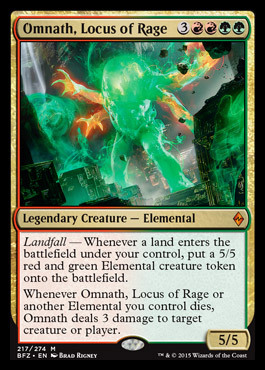 Omnath, Locus of Rage – This probably looks great in foil, and as a Commander, it will do a lot of damage. 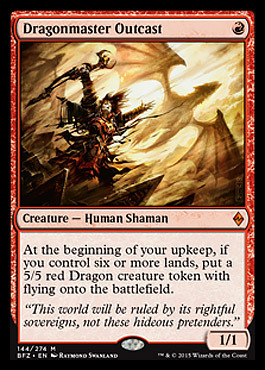 I’m not sold that this is better as its own Commander or if it fits beautifully into a Horde of Notions deck in order to give wrath insurance. By itself, though, it’s going to be a bulk mythic. To sum up, you pretty much just said every card prices are going down after release. That is so easy statement cause over 80% of cards will be like that. I think everyone will be interested to hear when you come up with 20% instead of rambling like in this article. Also, stat or graph is more preferable than a whole essay. Just IMHO. With all due respect, I stopped reading when you said Drana would be a bulk mythic and Greenwarden would be under $2. I couldn’t disagree more. That’s when I stopped reading as well tbh. Drana has received more praises so far than most cards in this set. 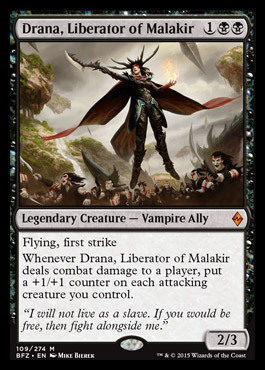 If I had to guess one card that wouldn’t be bulk, besides Planes Walkers, it would be Drana. Even Ulamog is only priced higher because of hype and flavor etc. Drana is just pure playable and if she should ever hit bulk for any reason I would buy me a pile of them. Ps. 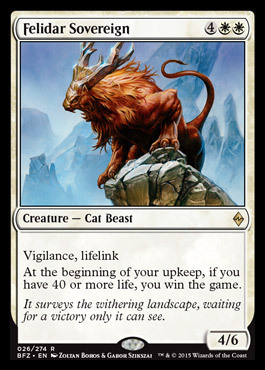 Undergrowth Champion is more bulk-worthy. What 3-drop in any archetype would you have him replace? Deathmist Raptor? Den Protector? Rattleclaw? Anafenza? I think not. The format is loaded with 3-drops that are already better. 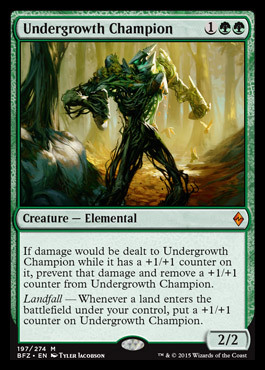 Undergrowth Champion is just a prime candidate for being exiled by the many removalspells and counterspells aimed at it in the format. There is no way it will be better than the existing KTK-block 3-drops for the next several months. That’s when you should KEEP reading…. It’s good you disagree with the writer, but I expect some arguments. You see, if you say something like that without arguments, what perception of you will I get now? Red Boom Boom (Sparky, Goblin, Goblin Grenade, Daño directo, Meter daño, etc).